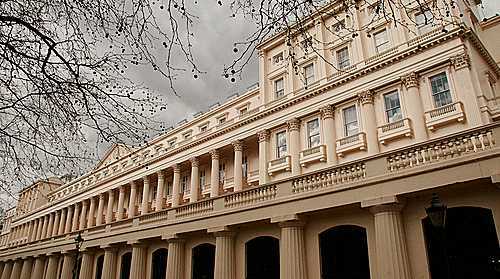 The Royal Society building, London. “The revised statement by the Royal Society Climate Change Summary of Science is full of scientific misconceptions as noted in the earlier post Royal Society in Free Fall, ” said the Professor of Applied Mathematics, Royal Institute of Technology, Stockholm. Leading Canadian Climate scientist, Professor Tim Ball, emailed this author to add his own comments and suggests the issue of residency time was part of the strategy to increase the focus on CO2. He says, “It is part of a bundle of claims about CO2 that are now shown false and Dr Kaiser’s is another major correction. I believe they were all produced with malice and forethought driven by the political need to demonize CO2.” Professor Ball further believes such a position is supported by the evidence of how the RS dealt with other issues including advocacy of dubious computer programs. Kaiser, a Canadian citizen for decades, is a professional chemist of almost 40 years’ standing who conducts research in environmental chemistry as well as being a successful science author. His latest book ‘Convenient Myths,’ examines “green desires and expectations and juxtaposing these with the physical and chemical facts and realities” urging us to all be skeptical in the continuing climate debate. Moreover, the CFP article refers to data collected by the National Oceanographic and Atmospheric Administration (NOAA). Figures show one volcano alone is estimated to emit 9×10^6 kg CO2 per day, or 10^9 kg C per year. The article advises us there are thousands of other volcanic vents, above ground and below the sea, which also emit CO2 on a continuous basis, not to mention the occasional but massive eruptions of volcanoes which have been dormant for many years, such as on Iceland earlier this year. Kaiser, K. L. E, ‘The Carbon Cycle and Royal Society Math,’ Canadafreepress.com (October 13, 2010), accessed online: October 14, 2010. Johnson, C., ‘FRS Multiplication Table and CO2,’ claesjohnson.blogspot.com (October 14, 2010), accessed online: October 14, 2010. Ball, T., email correspondence with author (October 14, 2010). Hertzberg, M., email correspondence with author (October 14, 2010). Two commenters at Sullivan’s site point out there is a distinction between residence time and response time. “There is a difference between residency time and impulse response time. You can have a short residency time because large amounts of CO2 both enter and leave the atmosphere naturally every year. But the time an increase in the amount of CO2 lasts may be much longer. Time to put this graph on display again – lest we forget. Seems we have a new outlier – RS by “several millennia”. Sorry but you have been sucked in by O’Sullivan! Here a very brief primer on why O’Sullivan is completely mistaken and has fallen for a school boy level of understanding of the matter. It is a fallacy (O’Sullivan) to assume that excess CO2 in the air would somehow drain quickly into the ocean. To the contrary, if we were to remove CO2 from the air we would see outgassing from the Ocean to balance this removal as the two systems (air/ocean) are really one system. The fizzy drink bottle is a good analogy. In relation to the RS (and not this story, on which I have no comment), the article below by Ben Pile is a very well written and thought-provoking piece on the Royal Society and its position in society and politics. There are substantial uncertainties in our knowledge of the CO2 cycle. There is also the matter of the oceans outgassing CO2 as temperature rises, and here you have a choice: you can decide that temperature has been rising, in which case some outgassing has occurred, and declare your guess of how much. 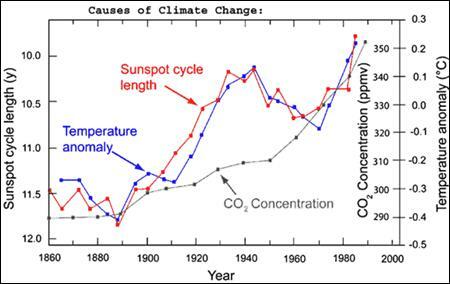 Or you can decide that temperature has not been rising, so more of the increase in atmospheric CO2 has been due to human activity. But then you face the necessary conclusion that the increase in CO2 has not raised the temperature (or has raised it by less than was thought). Hot Topic offers a limp-wristed refutation of O’Sullivan et al. which needs dismantling. Soon, soon. So many students with their papers, so little time. Problem being, Samoht , that CO2 LWIR is unable to heat the ocean in the first place. So relax – don’t panic, there is nothing to worry about. You do not understand my post. My post is simply making the point that neither Treadgold nor O’Sullivan comprehend the matter they are talking about. They think that because roughly 1/2 of the human CO2 emissions do not show up in the Atmosphere that there is a large drain of CO2 from the system that would speedily remove any access CO2 from the air once we stopped adding it. However this is entirely naive and wrong. The “missing” CO2 is largely in the ocean surface layers as there is a ready exchange and balance between atmospheric and the ocean surface. This is a “balance” whereby CO2 either enters the ocean when the atmospheric level increases or gasses out when the atmospheric level drops. The only way to remove CO2 from this active balanced system is through the slow drains of CO2 into long term removal. These drains are through rock weathering and ocean sedimentation. If we stopped adding CO2 today to the Air/Ocean system the current atmospheric levels would reduce slowly according to the flow rates of these drains. Contrary to what Treadgold says here the pathways of CO2 have been studied well and there is ample literature on the topic. The hobby scientists like O’Sullivan simply either do not know what they are talking about our deliberately raise issues in a manner designed to confuse the public. But so what , if CO2’s not the major climate driver or anywhere close? OK – let’s hear YOUR truth, if you disagree.. Please present the peer-reviewed papers that support the core notion of CAGW. FYI, we have some up our sleeve on this side of the fence. While we are at it, let’s talk about points-of-inflexion across the metrics, or don’t you monitor the science in that regard? And where, exactly, has all the warming gone? The excess “heat” is “missing”. Kevin Trenberth can’t find it, and if he can’t, I doubt you can. But if you do know, please tell us. The world is waiting for the answer. I’ve heard the Marianas Trench is quite deep – have you looked there? So do you disagree with the statement that the RS is a political instrument? Do you not accept that science has been a political instrument for many centuries? There are many historical precedents. These are not lies, we are not “deniers”. I am happy to have a rational discussion. So I take it (from your remark), that you consider ACO2 to be the planet’s major climate driver. Science is drawn into politics if it makes predictions or delivers findings that require society to take note and possibly act. Precedents to the current AGW debate are for example Tobacco regulations derived from science linking disease to smoking. Funny that many of the same figureheads who then fought against the points of science and for the Tobacco companies are again in battle against the points of science and against the idea that society should act upon the advice of scientists. The RS is not a political organization. The debate has been politicized by those who can not separate the political interests calmly from the debate about scientific matters. You probably want to draw our attention again on your sunspot cycle length theory. As of papers about CAGW I am sure no matter how many I would cite here, it would not matter to you. [YOU MAY BE SURE, BUT this is insulting. Please cite some references. – Moderator] I suggest to turn on the Scholar option in Google and have a go yourself if you would like references. Actually – no (sorry to disappoint you). 2) There is heat energy being stored in places where we are not seeing it and the trouble with that is that it will haunt us later. Did you come up empty when you tried? 1) ‘There is no missing heat” – a strong possibility, I agree..
Golly Samoht – that’s frightening. When you say haunt, do you mean, in a searing, boiling, crucible, kind of way? Is this the “millions and millions” of degrees that Algore was talking about? O’Sullivans article did not live very long on his site, it has disappeared. Perhaps he got embarrassed? Perhaps this one was just so wrong, even he could not live with it…. You have an excellent side-step Samoht – I’m impressed. Does avoiding the unpalatable TRUTH of climate phenomena – temperature correlations that are in far better agreement than the fleeting and tenuously apparent 1990’s ACO2 – temp correlation, come easier with practice? Seeing you’re such side-stepper, how about a change of subject? Would you like to discuss CO2 forcings datasets? You know, the Law Dome – Mauna Loa splice (looks like a hockey stick). That WAS a bogus contrivance wasn’t it. Isn’t it remarkable, how the Mauna Loa data provides such an an up-tick? And the two datasets are so disparate. What is your opinion of this type of data manipulation Samoht? Is it an honest and TRUTHful basis for model simulutions that produce the guesses, sorry “projections”, of such certainty out to 2100, that we must radically “de-develop” (as John Holdren puts it), entire western economies, leaving China and India to carry on their coal-fired industrial boom, regardless. It does seem a bit far-fetched don’t you think? That sounds like the “could”‘s, “may”‘s and “potentially”‘s we read so often in the IPCC reports. They really don’t seem to be very certain of the weather, sorry climate, around 2100, do they? another cold Northern Hemisphere winter (like last year)? The Southern Hemisphere winter was a bit cold too, wasn’t it? Warming not going to plan? the debate has been politicized by those who can not separate the political interests calmly from the debate about scientific matters. I would agree wholeheartedly with that statement you made above. 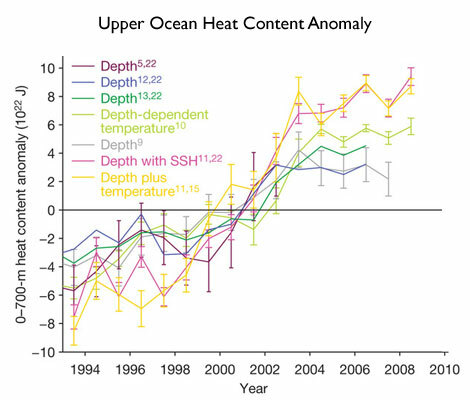 How does that article (of dubious extraction) explain the global ocean heat content? Or, to put it another way, the planet’s greatest heat sink, is giving up its heat despite the best efforts of CO2. http://www.nodc.noaa.gov/OC5/3M_HEAT_CONTENT/ (Yes I know – same provenance). Bet you’re hoping we don’t see THAT again this year. It would really set an alarming trend if we did. I’ve just checked the weather forecast for Britain, Samoht – not looking good. A wintry feel to the weather developing during the next few days as a cold northerly wind develops across Britain during the first half of next week. It should certainly be cold enough for some wintry showers in Scotland, with accumulations of snow over higher ground. Even higher ground in northern England may well see some wintry showers bringing a mix of rain, sleet and snow during the middle of next week. Overnight frost is also likely at times, with temperatures in the north possibly getting as low as -5C locally, making it very cold for the time of year. There are now signs that coldish conditions will last until next weekend, making for a longer cold snap than had looked likely. A hat trick of cold winters for the UK? In Britain between 1991 and 2007 most winters were mild, but the last two years have brought a change, with 2009/10 bringing the coldest conditions since 1979 to many parts of the country. So a cold winter this year would mean the third in succession. Is it likely? As ever, long range forecasting is about identifying broad patterns and trends, and given this TheWeatherOutlook view is that a colder than average conditions are likely this winter. However, the pattern which develops may be different this time, with the cold tending to come more from the east or south east rather than the north east. In this scenario the heaviest snow often occurs in the boundary zone between the cold dry air from the east, and the mild and moist air trying to push in from the Atlantic, but the cold can be most persistent in eastern regions. Of course, you realise you’re using the “weather is climate” argument? You won’t get far with that, except to irritate. It will be the weather that irritates RT – not me. It’s worth mentioning that the weather patterns that Britain is currently experiencing exhibit similarities to what happened in the forties. So maybe there is a cyclical pattern here? I am distinctly underwhelmed by the “global warming is causing snow and cold weather” argument. Last year was the coldest winter in Britain in about 35 years. Your driver (the “A” part of ACO2) has just not got to grips with the task. It might be time to look for another driver – maybe even a team of drivers, don’t you think? Before you know it they’ll be skating on the Thames, wouldn’t that be a first . Still there, as you can see. Sorry, the threading got a bit messed up here. This was a response to the comment that the original article had been taken down. … which is not surprising really considering they started this nonsense. Hang on. Are you suggesting that the real world is a bunch of graphs from NASA, and people shoveling themselves out of snow drifts in London is not reality? It’s quite a difficult argument to convey to the general public. Last winter everyone in the UK was joking that “another 20 cms of global warming” fell overnight. Anyway, this thread has deviated somewhat from the CO2 residency argument. The thread got messed up because I pressed the wrong button. And who, exactly, started “this nonsense”? Go hence! Or to another of your choosing! Does your preferred centre of excellance operate in the same world as everyone else? It must be tricky working with such a limited set of metrics – I admire your fortitude. In passing, has it occurred to you, that Hansen’s extrapolation techniques render the NZCSET v NIWA Case – moot? i.e .Invercargill’s temperature, is just as readily derived from Kaitaia, and vice versa. Or, Spain’s temperature record’s are made obsolete by Scotland’s. Consequently, your preferred centre of excellence, turns out some very other-worldly data when compared to say – DMI. Who, I should point out, tend to take a more empirical approach. Or is the traditional scientific method now just old hat?. Would you not rather read the original works of the scientists working in the climate field? Also I don’t have the time to add the information that others have already eloquently provided. I am not sure what your specific question on “back radiation” is but a NASA scientist has made good site explaining IR radiation physics. You can purchase the radiometer he refers to in NZ and do your own experiments. and when you say ‘the original work of scientists working in the field’ to whom do you refer other than to Dr Roy Spencer? This is a political statement, not a scientific one. There IPCC list of contributing scientists would be a good start for you! L.S. Bernstein & Associates, L.L.C. Samoht, I have not been able to find Dr Roy Spencer’s explanation of how CO2 (not to mention ACO2) down-welling back radiation heats the oceans. The NASA page you presented as CAGW proof (in the absence of peer-reviewed papers) is a bit hazy on this too. We would be interested to see your explanation of the thermodynamic and chemical processes (give your physics degree a work out). We have a knowledge gap on this topic at this site and because we are always willing to embrace new learning, your contribution to close that would be valued. Given that the ocean is the planet’s greatest heat sink, we really should address this topic, I’m sure you’ll agree. It makes interesting reading as it exposes some of the circular reasoning in the CO2 forcing argument. Alternatively, if you can provide us with links to some peer-reviewed papers, that would help too. It seems the Royal Society has a knowledge gap too. You run a tight tight ship here RT. I can see I will have to change my ways. was my VERY BEST behavior! I just try to make people aware that CO2 has not yet been *proved* to be the main culprit in climate change. This is not the place where you should come if you seek basic education on matters of the greenhouse effect nor do I intend to give you a private lecture on the topic. This thread here is on a specific matter: How long will CO2 remain in the system if we would stop emissions. On http://www.drroyspencer.com : while he gives a good intro on backradiation (thats why I pointed you there) I do not agree with his assessment on other matters on his site, especially not his essay on water vapor versus CO2 forcings / feedback. Back radiation reduces the net heat flow away from a warm surface by sending some of the IR radiation back. Obviously if you had a perfect IR mirror over a warm surface the net radiation loss from that surface in the direction of the mirror would be zero. Any matter that absorbs and then also radiates IR will contribute to the greenhouse effect. It ‘warms’ the oceans by affecting their net IR radiation balance. Unfortunately, what I present here is just a blog posting. It would take another peer-reviewed paper that follows an alternative path, to effectively counter the Lacis paper, and show that it merely concludes what it assumes at the outset. I am only outlining here what I see as the main issues. Of course, the chance of editors at Science allowing such a response paper to get published is virtually zero. The editors at Science choose which scientists will be asked to provide peer review, and they already know who they can count on to reject a skeptic’s paper. Many of us have already been there, done that. Perhaps the editors at Science simply find way to much fault with Spencers arguments. If Spencer can not convince his peers than probably he needs to come up with more evidence. Thanks Andy, there’s a whole lot going on in that commentary. I will post the link under Climate: Clouds in Models. It is a VERY interesting development given the position of the GISS ModelE in the simulation arena i.e I think there is some desperation here by GISS. ModelE is a “conventional” model that is in danger of becoming on the outer in comparison to newer generation models that incorporate Cloud Resolving Models (CRM’s)to such an extent that it may be irrelevant or cause a rift in the “narrative”. I see some strategic positioning to deflect attention from this and to try to discredit the opposition. There is even in-house NASA rivalry at play. BTW. O/T but still science/physics. The Spencer – Miscolczi showdown at the Spencer corral must go down as one of the best examples of cutting-edge, truth seeking, cut-and-thrust ever to be enjoined and witnessed on a global scale. We are very privileged to be able to follow it in real-time. This encounter would have been undertaken by snail-mail pre-internet and any resolution would have been unlikely within the lifetimes of the protagonists. Not so now. New papers are raked over in a matter of months. I would be happy to provide relevant links to anyone interested – just drop a reply below. There is much to the story, including intrigue (Miscolczi – NASA), ego, battles of wits, cutting-edge science and on and on. I am a fan of both so was most interested in the encounter and intend to revisit it in the future – life expectancy permitting. See also, Dr Roy’s subsequent posts on the same topic. “Our JGR Paper on Feedbacks is Published” – a must read. “Five Reasons Why Water Vapor Feedback Might Not Be Positive” – Brilliant! I will do some linking of the above in the appropriate Open Threads categories soon, hopefully – life expectancy permitting. published in the obscure “Quarterly Journal of the Hungarian Meteorological Society” and nowhere else, for obvious reasons. “Rebuttals” from either Sceptical Science or RealClimate (probably the two most ill-named site on the internet) don’t hold much credibility for me. The latter was set up partly by one William Connelly, now topic banned from Wikipedia for overly biasing climate pages in favour of his own views. It’s hardly a recomendation for impartiality is it? Are you prepared to provide however the basis upon which you made the assumption that I am ‘desperately fishing for confirmations to … preconceived ideas’? It’s a bit of a generalisation from someone with a physics degree. Try doing a search on ocean acidification. The CO2 cycle is well understood. The PH of the oceans are significantly changing because of increased atmospheric CO2. The reduction in PH is threatening many species of shellfish. Setting aside AGW – which should be of serious concern – Ocean acidification is also a serious threat to sea life. “It is a VERY interesting development given the position of the GISS ModelE in the simulation arena i.e I think there is some desperation here by GISS. Is my analysis way off? FYI: Samoth’s, or Thomas’ last name is most probably Palm. He’s nicked TTTP by Swedish blog-writers, which spells out: ‘Thomas The Tippingpoint Palm’ and he is truly making full cred of that nick. His style of writing/’discussing'(?) and general appearance [here] are identical to what can be seen/read [though in Swedish…;) ] at: http://www.theclimatescam.se – there, though, he is Thomas. Acidification means, becomes more acidic, i.e the pH of the oceans is reducing. The pH scale is a measure of hydrogen ion concentration in a solution. More acidic means more hydrogen ions. What’s the opposite called — alkalinisation if you’re old-school or basicisation (basicise?) if you’re younger? Ocean pH occurs in a range from about 7.8 to 8.3. The lowest pH occurs in upwelling areas and the highest pH occurs in the centres of ocean gyres (rotating areas). It would be difficult to calculate the ‘average’ pH for the oceans, let alone whether they have become more or less acidic. 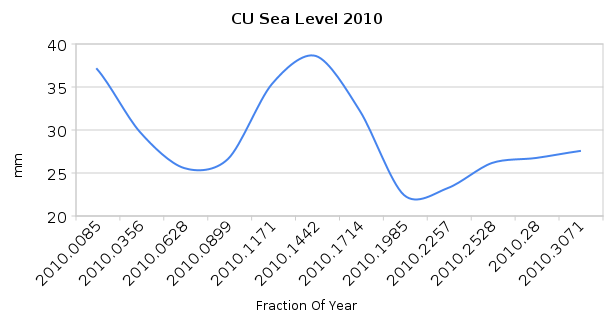 Note that upwelling areas are more acidic because high-CO2 bottom water surfaces, warms up and makes CO2 more readily available, a bonus for photosynthesis by marine plankton. They say there are few time series of ocean acidity, so few conclusions should be drawn, especially about the cause of any increase in acidity in a region. Natural variability is regular and fairly large. There appears to be a maximum pH, as there are no excursions to pH higher than about 8.15, but frequent excursions to lower pH levels such as 8.02. There are some interesting graphs.